Theodosia Burr Alston, daughter of Theodosia Prevost and Aaron Burr was born in 1783. In raising their daughter to exemplify Mary Wollstonecraft’s feminist ideals, the widower Burr’s nearly obsessive parenting nearly rivaled Young Theo’s love and devotion to her father. When her mother died of cancer in 1794, Theo, at age 10, stepped into the role of mistress of Richmond Hill, her father’s estate in New York City. In this she exemplified both her mothers talents and her father’s politics. As hostess she entertained and charmed a handful of early presidents, the exiled French statesman Talleyrand, the Mohawk chieftain Joseph Brandt and Alexander Hamilton. Reputedly wise beyond her years, as confidante to Aaron Burr, sometimes known to get himself into complicated romantic attachments, she gave loving relationship advice. She would need it herself when, in the summer of 1800, she met well-heeled Joseph Alston, soon to be Governor of South Carolina family. In February 1801 they married. Theo made her new home in South Carolina, supervised two plantations and the family home. It was not what a liberated woman was meant to be doing. She missed her father. She missed the educated milieu he’d accustomed her to and the hot, humid, swampy low country, for her, no match for the beauty of the Hudson. In May 1802, the difficult birthing of a son, Aaron Burr Alston, drained her of her youth and happiness and her weakness, coupled with the new demands as First Lady of South Carolina began to take their toll. 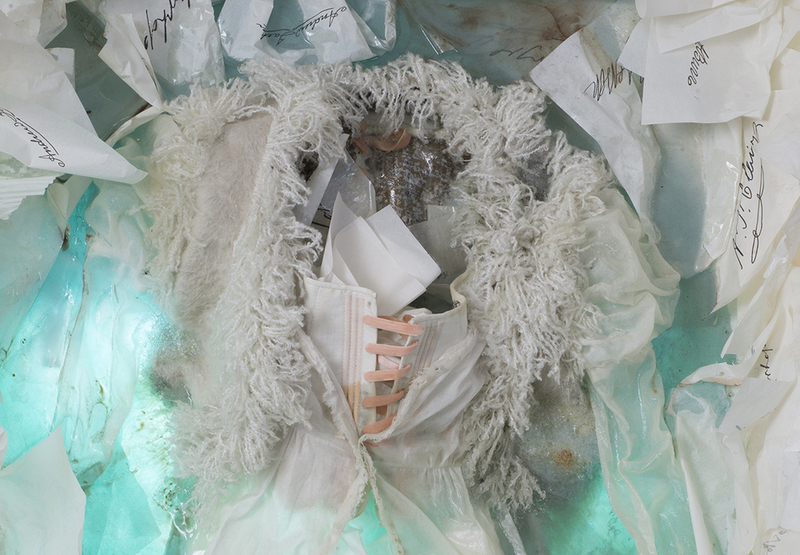 Silk boned bodice, cane boning, silk, paper, books, coffee, dried plant matter. Base realization Lucia Del Sanchez. As did her concern for her father when, in 1804, Burr's political career quickly disintegrated. The heated political climate of the day found Burr and Hamilton in opposition. Their rivalry descended into a largely one-sided war of personal insults that will result in the Cain and Abel story it is ill remembered as. Vice-President Burr, outraged beyond apology, challenged the guilty Hamilton to his final duel and won. After arduous trials, Burr was acquitted, winning the battle, not the war, leaving the country, a once-powerful leader in voluntary exile by 1808. The ordeal adding to Theo’s increasingly frail health, in June 1812, her son dies of a tropical fever to her inconsolable loss. She wrote to her father, "omnipotence could give me no equivalent." When Burr returns from his European exile to New York, the father daughter reunion compels her to take an arduous journey. Husband, Joseph Alston, was reluctant for Theo to make the ocean voyage. The country was at war, the seas Britannia’s, the Carolina’s Outer Banks a pirates’ haven, and Theo's health precarious. He wrote to the enemy blockading the coast, requesting safe passage for his wife and sent her off on a poorly disguised privateer schooner, The Patriot. A tireless supporter of her father, Theodosia had worked to raise money and social support for Burr during his exile. Prior to his flight, he had entrusted her with his most important manuscripts, documents, and personal correspondence. She brought these documents along, his two volume handwritten manuscript history of the American Revolution amidst, and a recent portrait of herself dressed in white. It was a dangerous voyage. Anything could happen and did. The journey to New York normally took five or six days. After two weeks pacing the Battery, Burr had reached the inevitable conclusion. He later learned that the British fleet had stopped her ship off Cape Hatteras on January 2. Governor Alston's letter, he was told, had worked, and the British allowed the schooner to pass. Later that night, a gale rose, beyond that, no more is known, though pirates’ atrocities are suspected. Burr concealed everything that reminded him of Theo and never spoke of her again.